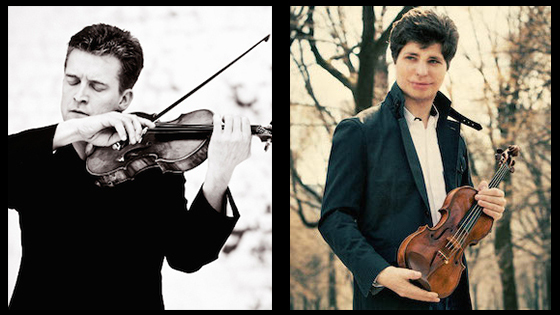 December 7, 2015, 11:40 AM · Congratulations to violinists Augustin Hadelich and to Christian Tetzlaff, who each were nominated for the 58th Annual Grammy Awards. All nominees were announced Monday morning by the Recording Academy. Christian Tetzlaff and Augustin Hadelich. Hadelich was nominated in the "Best Classical Instrumental Solo" category for his performances of Dutilleux's Violin Concerto and "L'Arbre Des Songes," from the album Dutilleux: Metaboles - Violin Concerto, L'arbre des songes - Symphony No. 2, Le double. Tetzlaff was nominated, along with Tanja Tetzlaff and Lars Vogt, in the "Best Chamber Music/Small Ensemble Performance," for their performance in the album Brahms: The Piano Trios. Also nominated in the "Best Chamber Music/Small Ensemble Performance" category was the Takács Quartet and Marc-André Hamelin for Shostakovich: Piano Quintet, String Quartet No.2. Among the 83 categories, there are eight classified as Classical Music. Click here to see all nominees in the Classical Music categories. Here is a list of nominees in all categories, selected from more than 21,000 submissions entered. The 58th Annual Grammy Awards will be held Feb. 15 Los Angeles' Staples Center and broadcast live on CBS from 8 to 11:30 p.m.